Quiet Toronto Coach House 1 Bedroom, 1 bath, 200sq deck. 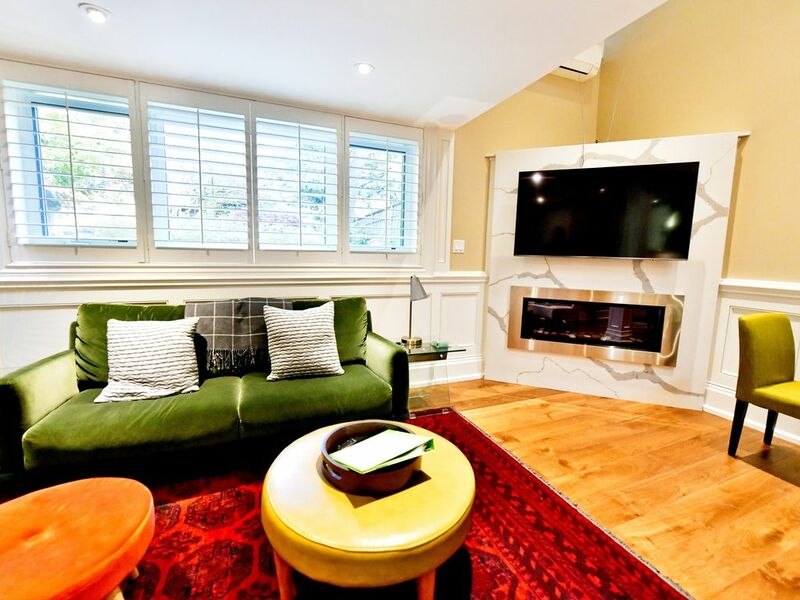 This coach house is a self-contained, private house with private entrance, located in Toronto prime residential location, situated walking distance to Rosedale and Sherbourne subway stations (9mins). It is also located walking distance to Bloor St. and Yonge Street shopping areas (10 minutes). This is a quiet upper scale neighbourhood, filled with century old homes. The coach house has a living room, dining room, kitchen, bedroom and large bathroom. The kitchen has European cabinetry, stainless countertop, Wolf gas range, Liebherr refrigerator, Miele dishwasher, and all the other kitchen items one would need. The living room has comfortable seating for 4 people. It offers a Samsung QLED flatscreen tv with Amazon Prime, Netflix, and HBO and movie channels. There is free internet throughout the coach house. There is on-suite laundry (Miele washer and dryer). The second floor contains the bedroom and build-in wardrobe. The large window overlooks the back garden. There is a large travertine tiled bathroom with glass shower rain shower head. The coach house is self contained. It is pin drop quiet. Private entrance. Free parking. You have use of your own private 200 sq foot deck. for more information about Rosedale toronto: see google. You get the best of both worlds. You can live in a quiet, safe residential area filled with century old homes, surrounded by mature trees, that range in price from 4 million to 25 million, yet be steps away from shopping and restaurants. This property is self-contained and a detached structure. It is an independent house that means once you close your door, it is pin drop quiet. It has everything you need, from gas range to washer and dryer. The kitchen is fully stocked. It has its own heat and AC. It has a 200 sq ft deck (Brazilian ipe chestnut) overlooking a mature garden. The finishings inside this newly renovated house are prime. Where else in VRBO will you have an $8000 stove? stainless steel European washer and dryer? $6000 refrigerator? All this is accessible for a reasonable price. Fabulous coach house, incredible host!!! We stayed in this coach house for a long weekend and the host, Susan, was prompt, professional and extremely helpful from the first minute we made contact through the VRBO site. Susan's responses were immediate and thorough, and she was very helpful as we navigated through a weather caused delay in our arrival. She continued to provide directions, advice through our sta, much more hospitality than we usually experience at our VRBOs. The directions for entry and use of all amenities in and on the property are well laid out and very clear. The coach house was just lovely, and even more spacious and comfortable than the pictures reflect. The bed is extremely comfortable, there is vast storage for personal belongings in the bedroom and bathroom, and very high end appliances throughout. The kitchen is well appointed, as is the bath with soaps, shampoos and a hair dryer. The living room furniture and dining area are very comfortable and a pleasure to spend time in day or night. We enjoyed both the back and side patios, and Susan made each ready for us to take advantage of, even though the weather had just turned unseasonably warm that weekend, allowing for outside seating. We are already in contact with Susan about booking one of their available rentals for our next visit to Toronto, as we don't believe we can find any better lodging in the area!!!! We’re glad you enjoyed your stay and hope to see you again on your next trip to Toronto. This was a great stay! The place was very clean and modern. If your looking for a good getaway that’s quiet this is a great place. We are pleased you enjoyed our coach house and thank you for taking such good care of it during your stay. We look forward to hosting you again in summer when you’ll be able to enjoy the deck and perennial garden in full bloom. Beautiful, clean, tastefully decorated coach house in a great location. Our hosts were very good responding to any questions and changes that we required. The apt was relatively new, very clean and beautiful. The shower was a little too hot and when I mentioned it to the owner they agreed to check it for us. We would highly recommend this apt. Thanks for your comments. We’re glad you enjoyed the coach. Hope to see you again. Susan’s coach house was exactly as described. It is a very well appointed beautiful home, extremely comfortable and in a lovely central neighbourhood. I will definitively be back. Coach house is a excellent place to stay, everything felt upgraded. Very convenient location to get to where you need to be, walk, transit or drive. I really enjoyed the privacy of your own entrance. We are glad you enjoyed the coach house. You were an excellent guest and we hope to host you again in future. Thanks again for choosing to stay with us. The coach house on the grounds of historic Scarthmore House is located in Mid-town Toronto, only a few minutes walk from Yonge and Bloor Street, and minutes walk to both major subway lines. Yorkville shopping and dining area is about a 10 min walk. Scarthmore House is a century home (circa 1910) in Rosedale, an upscale residential neighbourhood in close proximity to all the city's attractions. It's streets are lined with mature trees and well manicured gardens and it is surrounded by parks and ravines and some of the best walking and biking trails in the city. However, it is also in close proximity to world class shopping and dining. Literally, the best of both worlds.